The words “Kill a Cop Save a Life” were found on the pillars located on 25th and Tasker streets at 5:03 p.m. Monday. 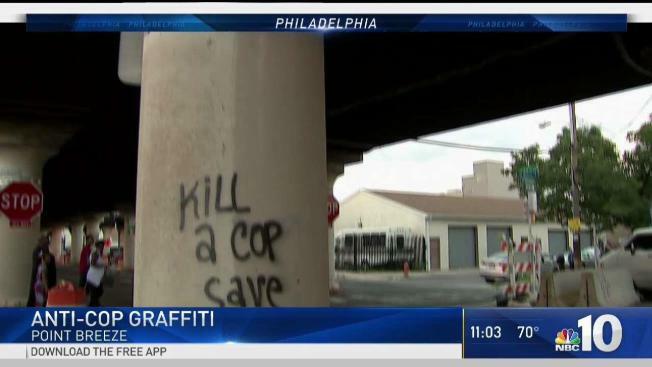 Vandals spray painted the phrase "Kill a cop save a life" on concrete at three different locations in the Point Breeze section of Philadelphia Monday. An investigation is underway after vandals spray-painted anti-police messages on three concrete pillars in the Point Breeze section of Philadelphia. Last month vandals also spray-painted the phrases "Kill a Cop" and "Right to Rebel" on homes along South Bouvier Street near Snyder Avenue in South Philadelphia.